In a previous post I talked about how an Employee Handbook enables a foreign company to focus itself on those U.S. employment laws and regulations that are most relevant to its activities and/or most likely to produce expensive problems. The handbook also tends to institutionalize simple and inexpensive practices designed to minimize employment risk. As a practicing CFO, I look for those attributes in solutions for foreign companies entering the US — as they start with less than 10 employees — that will reduce the risk of an expensive, time consuming, and distracting employment-related problem from developing. While hiring practices are complex, I want to identify two practices that foreign companies should understand and address before entering the US: job descriptions and offer letter packages. Job descriptions, especially, should be localized to the geography where a company intends to have employees. Job descriptions address two concerns that are relevant: 1) talent recruitment; and 2) employment risk administration including overtime and workers compensation insurance. From an employment risk administration perspective, the job description’s first priority is to identify positions as exempt or non-exempt from overtime rules. A Google search for overtime settlements over the past year will quickly demonstrate the cost of poorly administered job descriptions. While each state’s criteria are different, California and New York tend to be the most onerous and thus provide the market standard for how these problems can be costly. Most job descriptions are relatively straightforward to identify (e.g. outside sales positions are generally exempt; clerical positions are non-exempt). However some job descriptions are not so easy to classify and require revisions in order to clearly identify them as being of exempt status. Once a position has been identified as non-exempt, the company has the obligation to pay overtime and the opportunity to create compensation structures, including travel pay and time-reporting practices, to minimize the exposure and the cost inherent in non-exempt worker administration. Failure to heed this advice is a trap for the unwary. Job descriptions will also influence the cost of workers compensation insurance. Workers compensation insurance uses job descriptions to categorize workers into risk classification codes. Each classification code is assigned a risk code (cost rate, essentially a percentage of gross payroll) based on the historical losses of the general risk classification in the company. Under the best case scenario, foreign companies without a specific loss history will be assigned a rate based on the general loss history exclusively. Thus, job descriptions should be reviewed to ensure that risks (or the lack thereof) are clearly stated and communicated to the state agency that is administrating the insurance or the insurance broker who will be soliciting underwriters for a proposal. 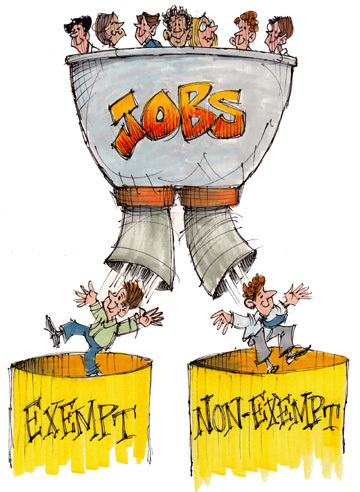 Proper classification of jobs as exempt vs. non-exempt can enable a company to avoid problems and expense and hassle of failing to pay overtime where it is called for based on job classifications. Clear precise job descriptions can make it easier for an insurance broker to properly classify positions for workers’ compensation underwriting and for a state examiner to conclude quickly that the classifications are proper. Care exercised in these activities promotes efficiency in the administration of a company’s human resources function enabling management and employees to focus on core business activities as opposed to controversies that result from improper administration of job descriptions.